Summer travel season is in full swing and the ever changing cost of gas is impacting everyone. To help with the big summer shuffle between activities for your kids and family road trips, Energizer has a deal to help make a positive impact on your gas budget. We’re rewarding Energizer® Lithium customers by helping their dollars last longer. Consumers simply purchase two packs of specially-marked Energizer® Ultimate Lithium or Energizer® Advanced Lithium batteries and you will get a $10 Prepaid Discover® Gas Rewards card mailed to you. It’s that easy. A $10 Prepaid Discover® Gas Rewards card will then be mailed to you from the fulfillment company. Easy enough, right? 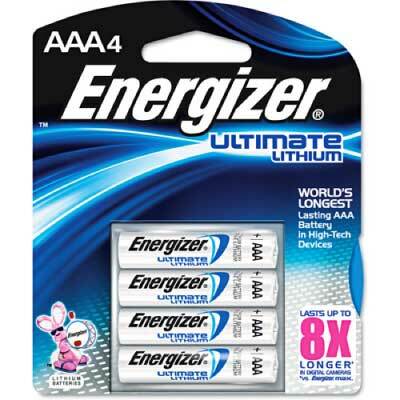 Energizer has also been generous enough to award one of my readers with a specially-marked package of Energizer® Ultimate Lithium and a package of Energizer® Advanced Lithium batteries in your preference of either AA or AAA size. Once you redeem the codes using the steps above, you will also be sent a $10 Prepaid Discover Gas Rewards card too. Don't worry if you don't need the gas money. The Discover Gas Rewards card can be redeemed for any merchandise at any store that accepts Discover. ** Vs. Energizer® MAX®. Results vary by device and play and/ or usage patterns. Disclosure: I received a gift card and batteries from Energizer for posting this information. No other compensation was received.